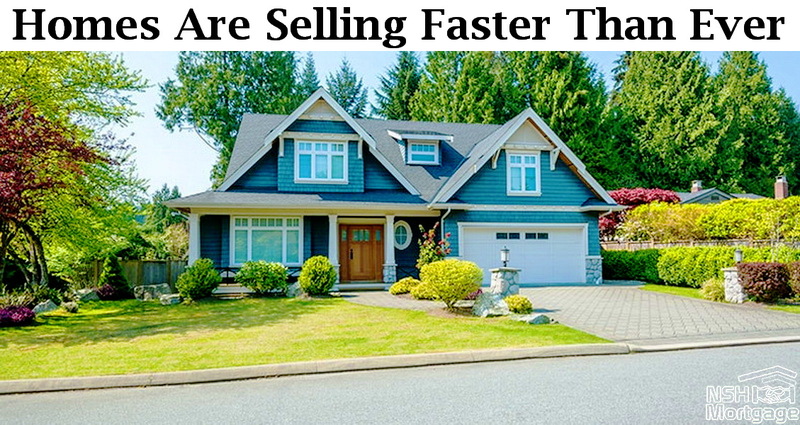 Homes Are Selling Faster Than Ever. NSH Mortgage has the knowledge and tools to help you with the ever changing housing market. Home sales are selling disturbingly quickly, according to the National Association of REALTORS®. In April, the average home sold in just 29 days, undercutting the previous record of 32 days set last May. Sales numbers suffered due to low inventory. 5.57 million existing homes sold on a seasonally adjusted, annualized basis last month, a 2.3% decrease from the month prior. If home buyers could find homes to buy, they would. But homes are getting snatched up, often for cash in days, not weeks or months. Often, homes are sold before buyers can schedule a viewing. These days, having a full pre-approval is a requirement for any buyer. Sellers will not consider a half baked offer, or for one that does not give strong evidence that the buyer is well qualified for a mortgage. The National Association of REALTORS® (NAR) released its April 2017 Existing Home Sales report, which showed 5.57 million homes sold on a seasonally adjusted, annualized basis. An existing home is a pre-owned house that is being sold again and does not include newly constructed homes. March’s reading continues to hold strong which has been seen so far in 2017. This year could be the best for home sales, eclipsing 2016 as the top 12 month period since the housing downturn. The factor holding sales back now, though, is ultra low inventory. As recently as 2012, home supply rose above six months, the inflection point between a buyer’s market and seller’s market. Existing Home Supply hit 4.2 months nationwide in April, up from 3.8 months in March, but still too low for comfort. There are now just over 1.9 million homes for sale in the U.S., that is down nine percent from a year ago, when inventory was already tight. It is not an inspiring statistic for any home buyers. Spring is when inventory is supposed to increase as homeowners put their homes on the market. But buyers are absorbing any extra inventory coming online, and then some. Low home supply is driving up prices. NAR reports that year over year home values have risen 62 months in a row, up six percent since last year. That is good news for sellers, not so good news for buyers. Will You Still Be Renting One Decade From Now? Mortgage rates are rising, and it is lighting a fire under home buyers. First-time and repeat buyers alike realize it is now time to buy before rates price them out of the home they really want. April’s home supply reading is evidence of the trend. Supply is little changed from all time lows set in December as buyers snatched up every available home. That month, inventory has fallen to an all time new low of 3.6 months so more homeowners choose to sell. On listing a home, sellers realize it will not be on the market long. The NAR reports that the average home stays on the market just 29 days, down from 34 days a year ago. The interesting thing about all this is, many renters are still putting off buying a home. Prices will go down, they say, and there will be more homes on the market, someday. And, many think that lacking a 20% down payment puts them out of the running for a home. That is a myth, the average first-time buyer puts down just six percent. Other buyers are PMI averse, costing them $13,000 per year in average home price appreciation. That thinking can be dangerous, to though. Some have been renting for more than a decade, vaguely planning to do it next year. Meanwhile, home prices have doubled in some areas since 2009. For many, it never feels like the right time, and there is probably no perfect time to buy a home. Only fair and good times to do so even though this year is well into good territory for home buyers, thanks to low rates and affordable home prices. One decade from now, many will still be waiting for the ideal time to buy. A recent report show that homes are surprisingly affordable. First American, a real estate title insurance provider presents a case that homes are 33% cheaper than they were at the height of the late 2000s housing market. In fact, it is not even necessary to look when prices were sky high to argue for today’s affordability. In 2000, homes were 10.3% more expensive, too, according to the study. The company formulates an index which takes into account not only nominal home prices, but average incomes as well as mortgage rates. Those other two factors play a big part in home affordability. For instance, a $250,000 home financed at 6% is nowhere near as affordable as one financed at four percent. The only time those two homes cost the same is when they buyer pays cash, the minority of home buyers in today’s market. For the everyday home buyer, then, the interest rate matters a lot, and with the example above, it is a difference of about $300 per month. Likewise, incomes matter since the average worker makes about 22% more than they did in 2008 according to the Bureau of Labor Statistics. So, a worker making $5,000 per month back then makes $6,100 now. That $1,100 per month goes a long way toward buying a house, almost the entire home payment in some markets. The next time you hear that home prices are too high, ask on what information that this claim is based on. Likely, it is entirely unfounded. Mortgage rates alone are not enough to extend an opportunity to buyers. The more important piece is actually available mortgage programs. Today’s market offers first-time home buyers a more flexible down payment, the likes of which has not been seen in nine years. Even mainstays of affordable housing, such as FHA loans, have made it even easier to buy. Mortgage insurance premiums were reduced last year. And, more lenders are offering these loans at the FHA suggested 580 minimum score. Conventional lenders have eased down payment requirements. The minimum down for loans backed by Fannie Mae and Freddie Mac is now three percent. The Conventional 97 mortgage and the HomeReady™ loan are both lenient about the amount of money you need upfront. HomeReady™ is available to buyers with incomes up to 100% of the median income in the area in which they are buying. In undeserved communities, the income limit is removed altogether. The USDA home loan goes further than even FHA and conventional loans when it comes to low down payments: it requires zero down. And, closing costs can come from a gift or even a seller contribution. Another zero down loan comes from the U.S. Department of Veterans Affairs. The VA loan is a veteran only mortgage for which current and former military service members earn eligibility with as little as 90 days of active service. These mortgage programs and others are even more affordable because of today’s record breaking mortgage rates. Home sales are rising, with little question that today’s home buying environment is one of the best in history.